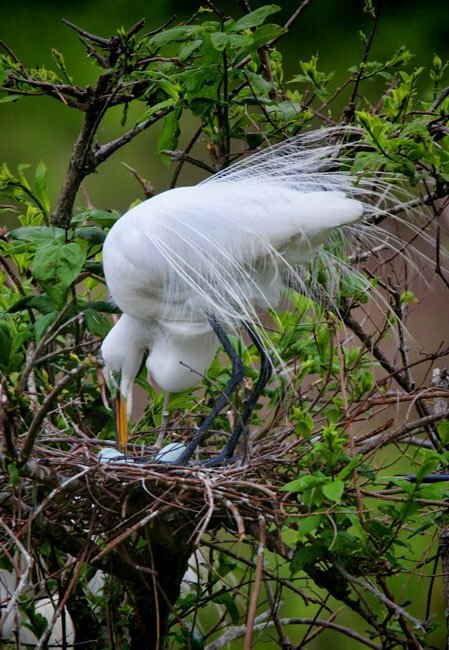 A great egret nurtures her nest at Cypress Wetlands and Historic Walking Trail, a nature trail and park in Port Royal. The natural community exists within the urban setting of Port Royal and is named for the bald cypress (Taxodium distichum) trees that grow abundantly in the surrounding freshwater. The park and trail are the result of an effort by the town to manage stormwater runoff while also providing habitat for native birds and viewing spots for visitors. A .56-mile-long walking trail feartures a combination of boardwalks, paved paths, and bike trails; it circles a sanctuary established by the town to protect nesting birds, including egrets, wood storks, and herons. The Cypress Wetlands property includes a variety of habitats, such as marshes, a lake, a duck pond, and of course, the namesake cypress swamp. Cypress Wetlands receives 80% of stormwater runoff from Port Royal. The stormwater flows to the swamp and filters naturally on its journey to the Beaufort River. The swamp is unusual, existing in the center of an active town. However, it is the swamp’s atypical setting that makes it both a successful stormwater filtration system and a thriving ecosystem. In May of 2012 the walking trail and a new amphitheater at Cypress Wetlands were dedicated. The park includes educational signage regarding both natural and cultural history of the area. Dogs are permitted on leashes.